To make French Toast: Grease bottom and sides of 13x9-inch pan; line with bread slices. Heat oven to 375� degreesF. Bake 25 to 30 minutes or until chocolate mixture sets. Meanwhile, make Strawberry Syrup. To make Strawberry Syrup: Heat strawberries, Bourbon, and maple syrup in 1-quart saucepan to simmering over medium-high heat. Reduce heat to medium-low; cook, stirring occasionally, until strawberries have softened. Slightly mash strawberries with fork or potato masher. Keep syrup warm until ready to serve. 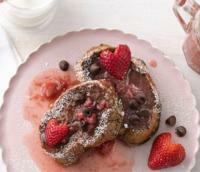 Serve with warm French toast sprinkled with powdered sugar and additional chocolate chips.